Don't let the sun catch you frying. On road or off, if you're planning to take your Jeep where the sun shines brightly and you'll be behind the wheel for a long drive, you'll want to stay protected from the sun's potentially damaging UV rays. With the Sunshade by Mopar, Item No. 82209061 available at JustforJeeps.com, you can block the rays of the sun and stay cool on that long ride with this convenient and foldable product. You'll have it made in the shade. Note: This is custom made for the 2005-2010 Grand Cherokee but will fit the 2011-2018 when you put the sun visors down to hold it in place. Pictures shown above are from a 2014. Shade will not fit completely flush in the 2011-2018 as seen in photos. 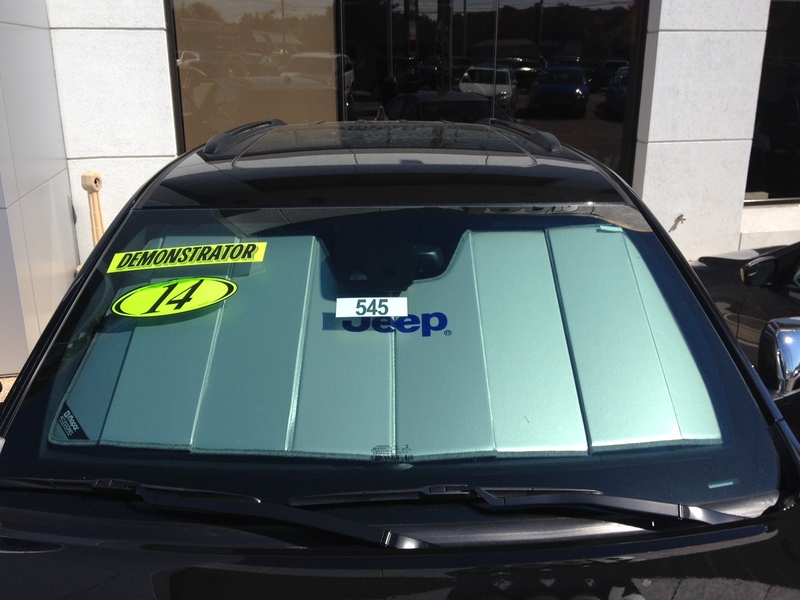 This sunshade not only looks great, it keeps out the heat for real! It's a little fidgety to get on when it first comes out of the box, but once you break it in and get used to it it's very easy to install. Great product. ProsVery good at keeping your vehicle cool. Looks great and covers the whole windshield. ConsA little bulky to store. Hard to install at first, but easy to get used to once it breaks in. I now own 2 Jeeps and both have their own sunshade. 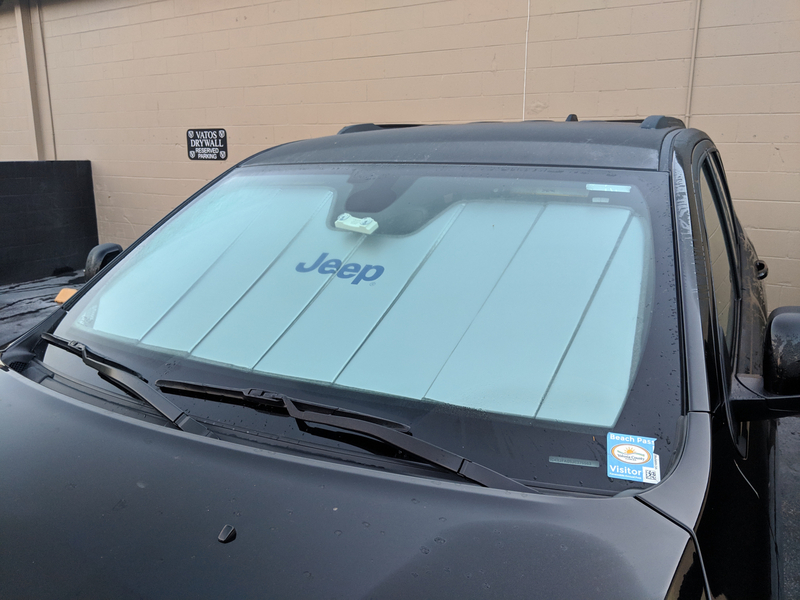 My oldest jeep is a 2005 and the sunshade has kept my looking great! This sunshade works perfectly in my Trailhawk. The storage bag Is a plus. The shade is durable and helps repel the heat from our Texas summers! Bought for a late 2015 Grand Cherokee High Altitude and it did not fit at all. It is a nice high quality sunshade, but is very expensize for what it is. I would not recommend this for a 2015. Doesn't fit exactly, is too big. I have other brands in other cars, cheaper and fit perfect. I purchased because of the JEEP word, not worth it. This review is for a 2014 Grand Cherokee Limited. The fit is only OK. As stated in the product description, the driver and passenger sun visors need to be folded down in order to keep the sun shade in place. And sometimes I have difficulty completely unfolding the sunshade and keeping it in place so I will fold in the one side and it fits OK but is almost unnoticeable to someone looking at the windshield from outside of the vehicle. But, I really like the quality and once in place it looks very nice from the outside. 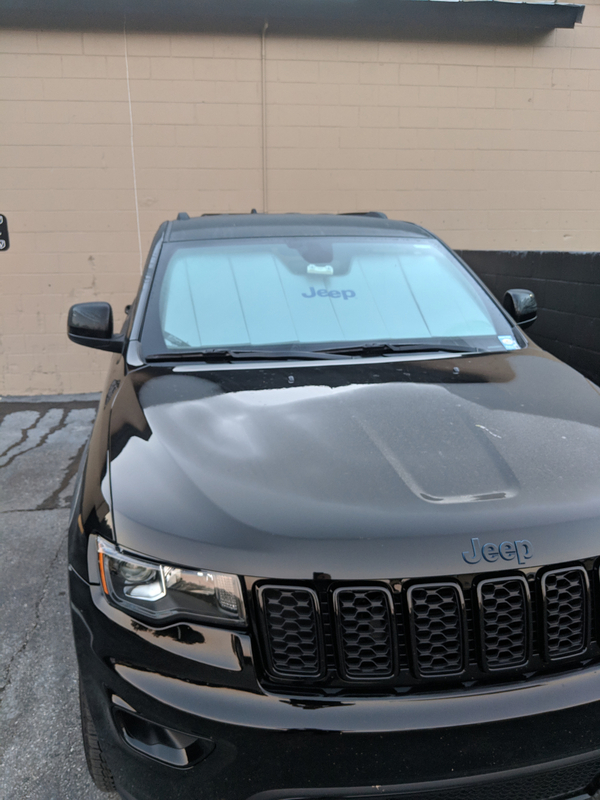 This appears to be a little pricey but when comparing to other high-quality sun shades it's a decent price and it's nice having the Jeep logo on the front. During the warm months when not in use, when folded up it fits flush in between the front passenger seat and the center console without sticking out of place. Just what I was looking for! Excellent product. I received my item very fast. It works to keep the sun out, but isn't a perfect fit and was outrageously expensive. ConsDoesn't fit the windshield perfectly, paid about 3x what it's worth. Definite buyer's remorse. 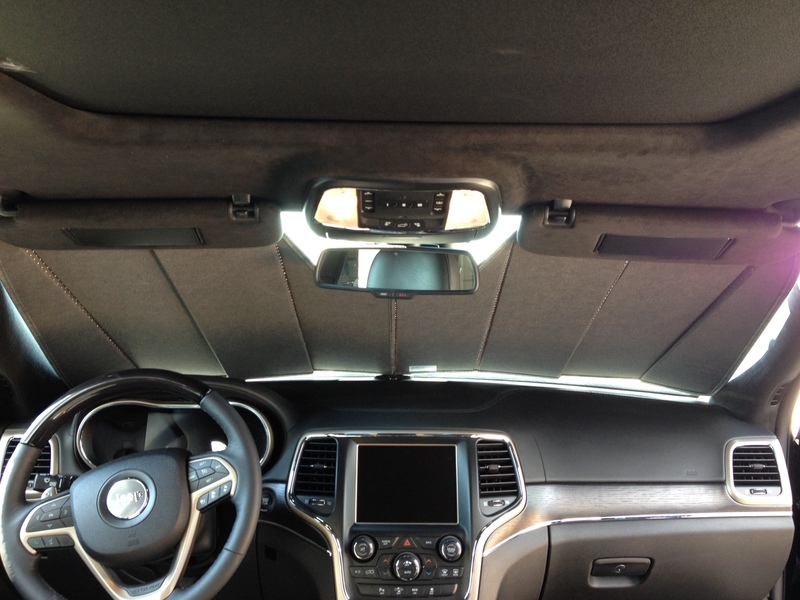 Great quality item that fits the Grand Cherokee 2014 perfectly. Even comes with a storage bag. ConsFolds in "both directions" so folding can sometimes take an extra minute.